Tunisian club Esperance failed to create a record unbeaten run in the African Champions League after losing 1-0 at ASO Chlef of Algeria on Friday. Cameroon-born striker Anicet Eyenga played the party-pooper, scoring midway through the opening half in Chlef to end a 19-match unbeaten streak by the defending champions spanning two seasons. Esperance needed to dodge defeat in Algeria to climb above six-time Champions League title holders Al Ahly of Egypt, who went 19 matches unbeaten between the 2004 and 2006 seasons. The Tunisians did overtake Al Ahly when they defeated compatriots Etoile Sahel last month, but the result was cancelled after the Sousse club were disqualified for pitch invasions. After losing at ASPAC of Benin last April, the 'Blood and Gold' went 12 games unbeaten to lift the trophy a second time and travelled to Chlef without a loss in seven qualifying and pool games this season. Apart from the chance of creating a record, there was little at stake with Esperance and Sunshine Stars of Nigeria already through to the semi-finals from Group A and Chlef doomed to finish last after three consecutive defeats. Esperance coach Nabil Maaloul seemed most concerned about avoiding injuries and yellow cards as he rested several regulars, including goalkeeper Moez Ben Cherifia, midfielder Youssef Msakni and Cameroonian striker Yannick Ndjeng. Al Ahly won Group B despite being held 1-1 by Zamalek in an Egyptian derby and dodged a semi-finals showdown with Esperance. Mohamed Barakat levelled for Ahly midway through the second half at the Borg El Arab Stadium in Mediterranean city Alexandria after Mohamed Ibrahim broke the deadlock just before half-time. Ahly completed a six-match schedule with 11 points - one more than four-time African champions TP Mazembe - after three victories, two draws and a loss in difficult circumstances. Spectators were barred from home fixtures because of post-Arab spring security concerns and domestic football has been halted since more than 70 people died in rioting last February after Al Masry defeated Ahly in Port Said. Already sure of a semi-finals spot, TP Mazembe surrendered first place after losing 1-0 away to Berekum Chelsea of Ghana with Jordan Opoku scoring 10 minutes from time. Berekum came third with nine points - a creditable achievement in their first Champions League campaign. 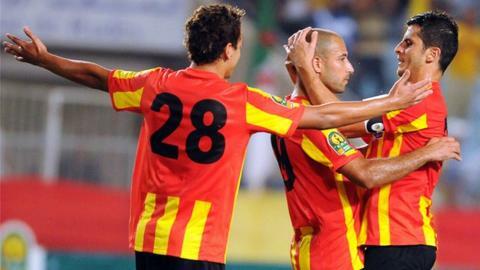 Al Ahly face Sunshine Stars in the semi-finals next month while Group B runners-up TP Mazembe meet Esperance. Apart from a $1.5 million first prize, the teams are chasing a place in the Fifa Club World Cup to be hosted by Japan in December.